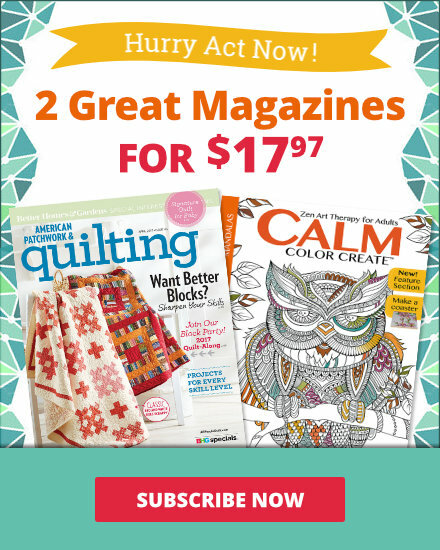 See the featured quilts and web-exclusive color options and projects from the American Patchwork & Quilting December 2016 issue. 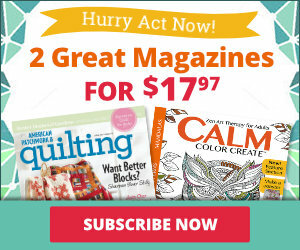 The December 2016 issue of American Patchwork & Quilting is on sale from October 3--December 6. Intentional color placement forms a subtle path while block rotation creates secondary star bursts. Use classic autumn colors to transform four blocks from a bed-size quilt into a fabulous fall wall hanging. A cream hue frames the tumbling leaves in the center. 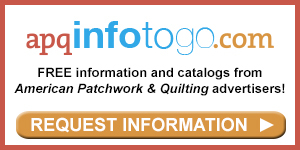 Get the free quit pattern here. 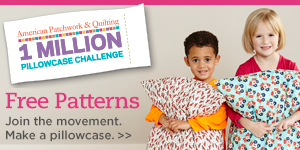 Play with improvisational cutting and bold fabrics to piece energetic hashtag-inspired blocks in two sizes. Playing with bright colors and bold patterns, quilt tester Laura Boehnke used a foundation of brown prints to let the hashtag blocks pop to the forefront. She chose more subtle patterns for the inserted rectangles and small sashing squares to balance the prints in the hashtag blocks. Cool colors bring tranquility to a small paper-pieced quilt. A floral line with Art Nouveau influences takes Twilight Echoes from cool and soothing to soft and traditional. To create contrast, quilt tester Laura Boehnke used a light green background and blush-color triangles along the border. Even the elves have to do laundry. Mix and match their essentials for a too-cute clothesline garland. Fussy-cut birds form the center of star blocks. A green single Irish chain provides the accent. Thanks to a stunning holiday garland stripe, the borders are easier than they look. Colorful foundation-pieced batik triangles seem to float in a deep blue background. Play "I spy" with the colors for even more fun! Using graphic geometric prints rather than deeply hued batiks, quilt tester Laura Boehnke played with the placement of the foundation-pieced blocks for her version of Confetti Baby Quilt. Strip-piece your way to a scrappy green-and-red throw with a spin on the Burgoyne Surrounded block. Create a classic. A simple rotation of monochromatic strip sets forms a graphic pattern for a throw perfect for movie night. 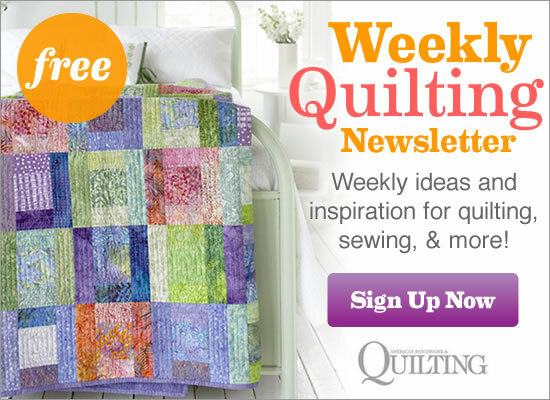 Stitch-and-flip corners create irresistibly easy blocks shaped like sweet breakfast treats. The pieced border even resembles the trimmed awning of a favorite bakery. By eliminating the pieced border and adding a high-contrast outer border, quilt tester Laura Boehnke visually created a frame for the pieced blocks. Vivid colors, with an occasional light block added for variety, means the blocks look more like Life Savers candies than donuts. Combine timeless prints in greens, reds, and creams in an on-point quilt. Pair seaworthy prints and summer colors for a throw that’s dripping with nautical style. Color blocking in the border and striped triangles mimic ocean waves.